This multi-part series will walk you through, step-by-step, how to create an investment asset management strategy that will maximize your returns and minimize risk. You’ll learn about various asset classes, how to choose the right mix for your risk tolerance, and how to rebalance annually. At the end of this series, you’ll have a set it and forget it approach to investing. An asset class is a group of similar investments. Stocks are an asset class. Bonds are an asset class. Real estate is another. Each asset class has similarities. Stock investing, or ownership in individual companies, is typically riskier than investing in bonds. For that reason, stocks typically earn higher returns than investing in bonds. There’s an inverse relationship between risk and returns. Investors demand higher returns when investing in riskier asset classes. When you diversify and combine various asset classes in the same investment portfolio, you’ll smooth out the risk while earning a good rate of return. Why do Investors Need an Investment Asset Management Strategy? The simple answer is, you need an investment asset management strategy to earn the highest returns for your personal risk comfort level. Here’s how you begin to create one. Here’s how I became an index fund investing afficionado. Before studying finance and receiving my MBA I was predominantly a stock picker. I did well using a value based approach. Most years I beat the major indexes. Although, my spouse and I also held mutual funds in our workplace retirement accounts, I picked stocks in the portfolio I managed and considered myself a stock picker. 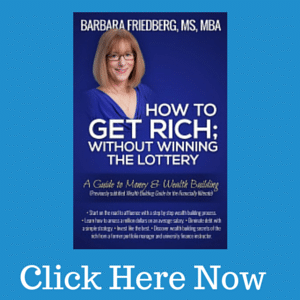 In spite of my stock picking success, over the years I learned that there is another way to excel at investing, which is less time consuming and equally as effective (and probably more effective over the long term) as individual stock picking. “So investors shouldn’t delude themselves about beating the market. They’re just not going to do it. It’s just not going to happen.” Daniel Kahneman, Nobel Laureate in Economics, 2002. The first day in my Investments class in the Penn State MBA program, the professor asked, “Raise your hand if you think you can outperform the markets.” My hand shot up. After all, I was a portfolio manager with a solid investing record. Throughout the class, I studied the empirical research and totally revamped my investing approach based upon the facts. That’s right, there are facts defining which investing approaches are most successful. Turns out, diversification based upon asset classes in line with your risk tolerance leads to returns which outperform professional investors 60-70 percent of the time. In addition to Nobel Laureate Daniel Kahneman’s quote, there are scores of well known economists and investors who support this investing approach including Warren Buffett. If I was doing so well picking stocks, why did I switch to an asset classes allocation and index fund approach? The research on asset classes is clear, 60 to 70 percent of active mutual fund managers fail to beat the indexes each year. You may be thinking, what about the 30 to 40% that do beat the indexes? Why not invest with the outperforming fund managers or pick stocks and outperform yourself? Well, here’s the problem, even if a professional manager outperforms the index one year, and let’s say the manager is extremely skilled and outperforms the next year as well, over the long term it is virtually impossible for anyone to consistently beat the indexes over the long term. If that’s not enough Buffett instructed his heirs to put his investments in index funds. Are you convinced yet that asset classes investing with index funds is the way to best professional money managers? If not, read on. What Rate of Return Can I Expect with Asset Classes Index Funds Investing? We use history to guide our estimates of future returns because the perfect crystal ball hasn’t been invented yet. There’s no proof that history will repeat, although in the 30 years I’ve been investing, U.S. and global businesses continue to grow. As long as world economies prosper, investors can participate in their growth through buying stock, bond, and real estate mutual funds. When companies grow, their stock prices go up. So, I believe it’s likely that financial assets will continue to appreciate. 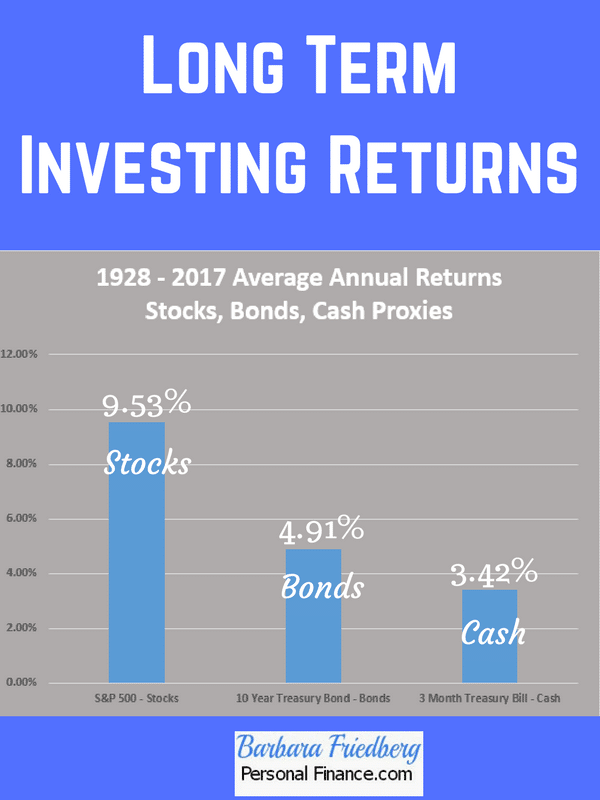 Historically, stocks offered higher returns than bonds, which performed better than Treasury bills and cash assets. So if this is the case, why not invest all of your money in stocks? In order to earn the higher returns, there’s a price to pay. That price for anticipated higher returns is greater risk or volatility. In any one year, stock investments might go down. In the worst years, a diversified stock portfolio could fall 10, 20, 30 percent or even more. Conversely, this all stock portfolio could also increase. Just look at recent stock market returns. In 2016 the S & P 500 increased11.74%. In 2015, the stock market returned1.38%, and in 2014 the market was up 13.52%. Notice that even during positive return years, there’s quite a bit of volatility in market returns. Before you get too excited, let’s check out some down years for the stock market. In 2008, the stock market dropped 36.55%. In 2002, the markets were down 21.9%. Stock market returns have a long term average return close to 10%, but during individual years there is a lot of volatility. Bonds are volatile as well, but less so than stocks. And because cash doesn’t go up and down in value, and is the least risky financial asset, it also offers the lowest return. If history continues, and you choose a diversified portfolio of index funds in a variety of asset classes you can expect a return in proportion with the amounts invested in each asset class. You’re likely to beat most professionally managed investment portfolios with simple index funds. 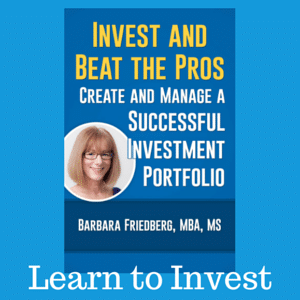 In the upcoming articles you’ll learn how to create your own index fund investment portfolio. If you’d like a free automated tool to calculate your risk tolerance and diversification strategy – check out Robo-Advisor Pros. What is your preferred investing approach? Do you invest in index funds? Looks like a worthwhile series Barbara, I look forward to the rest. I set up my asset allocation for growth because I have substantial fixed (pension & Social Security) income for retirement. My asset allocation includes high tech, biotech and skewed a little to small cap stock funds. I too, used to trade individual stocks. The dot-com crash weened me from that. Just for fun, I’m going to guess that Step 5 is an article on rebalancing. This is excellent, Barb. My husband and I were just talking about shifting our focus now that both girls are in university and we know funding is in place. 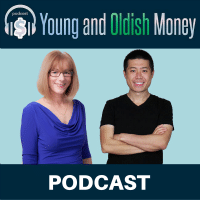 We’re early 50s, so we need to pour it on for retirement and our age made us decide to reassess our risk tolerance. Now we just have to find a time when we’re actually home together! @Kurt, I’ve wanted to lay out this step by step investing approach for a long time. It will help folks understand that investing does not need to be complex. @Krantc,-Sounds like you are somewhat risk tolerant Krantcents. @Betsy-Congrats for having the girls in university!! Enjoy the new stage. Binge saving is really helpful at this stage to boost retirement savings. Check out the entire series to get you going. For as long as we have been investing, we have based our choices on an asset allocation model. Marie, its the best way to get a high return for a given risk level. Looks like a really good series Barb! Look forward to the next article. I’ve been a huge fan of index funds for most of my adult life for the simple fact that the performance is better than most actively managed funds. Looks like it will be a watershed series on asset classes and index investing. Sure looking forward to it. I fancy myself as a rather newbie investor with a not-so big portfolio, am sure I’ll learn a lot to ease my path into investments and significantly grow it. @Paul, AGreed, index funds are probably the best investment product ever invented (by John Bogle). @Simon, You must stay tuned and learn how beginning investing when you are young will lead to building a large financial legacy.